I had asked for the Dutchman’s Puzzle block in brights, Kaffes or moderns. 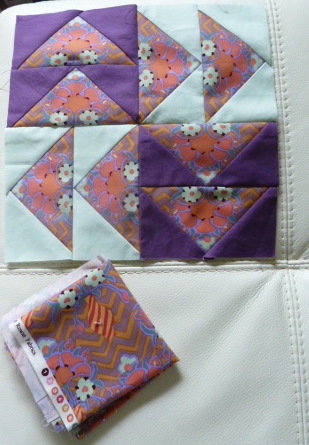 My partner Caroline did a little research and found out my favourite colours are purples and teals and so she made me this lovely block. You can’t see the pale colour well in this photo but it’s a lovely duck egg colour. That’s not all! Not being a Kaffe girl herself she sent me the rest of the fabric she used. Isn’t that generous? Thanks Caroline. I’m really thrilled with it. 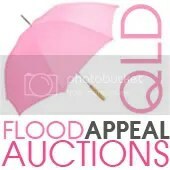 You can find the auctions here and here. The tally for all the auctions as of Tuesday was a massive $45000! Keep up the good work and thank you for your generosity.